Quality, Evidence and Effectiveness is unique in bringing together, for the first time, the critical concepts of quality assurance and effectiveness in relation to health promotion and research. Contributions from leading health promotion specialists around the world discuss how best to push forward evidence of the value of health promotion as an effective investment strategy. 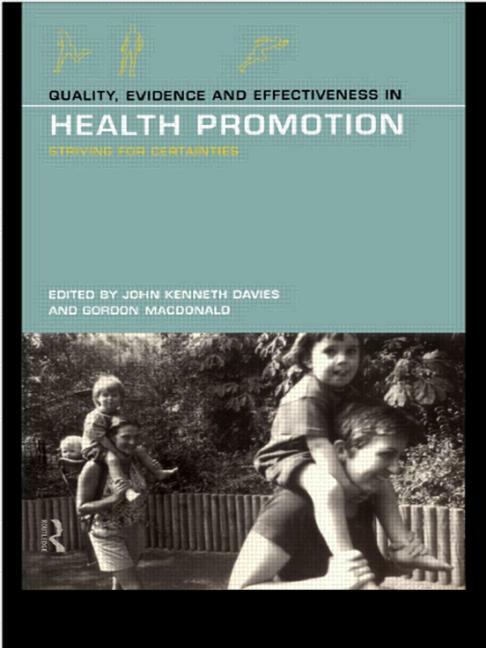 They examine particular examples of health promotion interventions, focusing on both practical suggestions and the concepts underlying them. Quality, Evidence and Effectiveness will be invaluable to students, researchers and policy-makers in health promotion and all professionals who are committed to the effective and efficient delivery of New Public Health. John Kenneth Davies is Senior Lecturer in Health Promotion at the University of Brighton; Gordon MacDonald is Professor of Health Promotion Policy and Development at the University of Glamorgan.